In our current education system too many high school students wind up with too few choices. Students are locked into what is decided for them by a broken system. Too often, they are handed a diploma that holds an empty promise. This practical field book is filled with effective tools from The Education TrustWest. 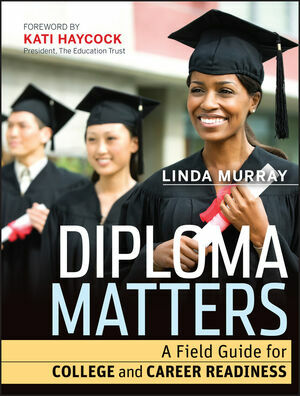 Diploma Matters helps school leaders and teachers examine the current high school experience and develop a detailed action plan that will transform curriculum and ensure that all students are ready for college and the workplace. Linda Murray is the Superintendent-in-Residence for The Education TrustWest (ETW) and is responsible for leading the practice work of the organization in California. Prior to joining ETW, Dr. Murray served as Superintendent of Schools for the San Jose Unified School District for eleven years. San Jose Unified—A Success Story. Chapter One: Dispelling the Myths. Myth 1: A College-Prep Curriculum Hurts Kids Who Aren't Going to College. Myth 2: The Curriculum Will Be Watered Down. Myth 3: Grades Will Plummet. Myth 4: Students Will Disengage and Drop Out. Myth 5: Disadvantaged Students Will Suffer the Most. Myth 6: High School Is the Wrong Place to Make Changes. Myth to Reality: Higher Standards Help Everyone. Setting the Foundation for Reform. A Defining Moment: The Students Speak. Getting the Teachers’ Union on Board. Setting Our Stake in the Sand. Chapter Three: The Journey Through High School. How Do You Turn Ideas into Action? Getting Serious About Summer School. Students with Special Needs and English Language Learners. Reaching the Outliers: Safety Nets and Supports. Bricks, Mortar, and Science Labs. Chapter Four: Teachers: A Force to Reckon With. Finding the Teachers We Needed. Teaching the Teachers: Professional Development That Works. Chapter Five: The Educational Opportunity Audit. Start by Defining Your Requirements. Here's Where the Real Change Begins. Setting up Committees to Get the Work Done. Work to Be Done by District Departments. Chapter Seven: A Look at “District X”. District X: Focus Groups and Community Conversation. Recommendations Based on All Findings. Chapter Eight: College and Career Readiness in Our Nation's Schools. How Is College and Career Readiness Playing Out in Other Districts? Chapter Nine: The Journey Continues. Where the Work Is Heading. The Good News: Universal Access. “D” Grades Remain the Greatest Barrier to College Eligibility. Appendix 1: Focus Group Protocols. Protocol for Student Focus Group Work. Protocol for Teacher Focus Group Work. Protocol for Counselor Focus Group Work. Protocol for Parent and Community Focus Group Work. Appendix 2: Community Conversation Protocol. Safety Net and Support Interventions Survey. Special Education, Alternative Education, and English Learner Survey. Career Technical Education (CTE) Survey.